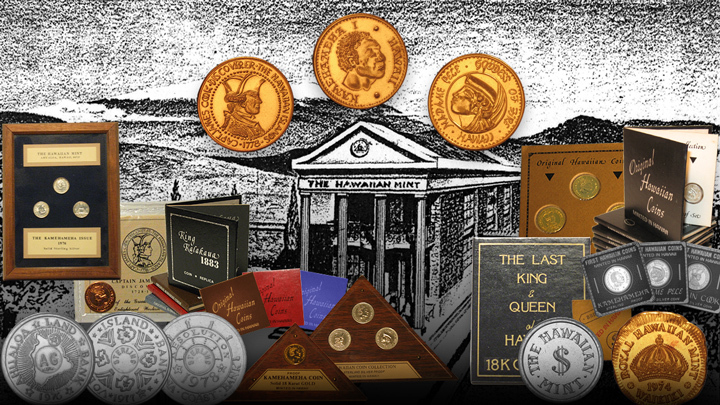 The Original Issues commemorate the three historic figures that interacted to unite Hawaii and establish the Kingdom of Hawaii. Two centuries ago, while Kamehameha was unifying the Hawaii Islands, a lava flow by Madame Pele, the volcano Goddess, aided Kamehameha to win an important battle and Captain James Cook, the enlightened British who discoverer of the Hawaiian Island, discussed military tactics with Kamehameha when he stayed overnight onboard his ship, the Resolution. These historic events inspired the Original Issues and were the sole mintage for the first six years of the Mint. The packaging for the original issues - minted in Hawaii from unique hand engraved dies - is equally exquisite with miniature booklets, triangular wood plaques and Koa wood frames.